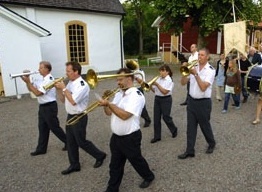 The Swedish band Medevi Brunnsorkester has since 1870 performed in the park of Medevi health spa. It has a huge repertoire of over 1,000 pieces (marches, walzes, polkas, opera/operetta medleys, ballads). The members strive to maintain the tradition of 19th century brass music but also add some newer music. Look for a classic brass sound from 100 year old Swedish-made cornets, valve trombone, alto and tenor horn, tuba and drums!